A Leyden jar (or Leiden jar) is an antique electrical component which stores a high-voltage electric charge (from an external source) between electrical conductors on the inside and outside of a glass jar. It typically consists of a glass jar with metal foil cemented to the inside and the outside surfaces, and a metal terminal projecting vertically through the jar lid to make contact with the inner foil. It was the original form of the capacitor (also called condenser). Its invention was a discovery made independently by German cleric Ewald Georg von Kleist on 11 October 1745 and by Dutch scientist Pieter van Musschenbroek of Leiden (Leyden) in 1745–1746. The invention was named after the city. The Leyden jar was used to conduct many early experiments in electricity, and its discovery was of fundamental importance in the study of electrostatics. It was the first means of accumulating and preserving electric charge in large quantities that could be discharged at the experimenter's will, thus overcoming a significant limit to early research into electrical conduction. Leyden jars are still used in education to demonstrate the principles of electrostatics. Discovery of the Leyden jar in Musschenbroek's lab. The static electricity produced by the rotating glass sphere electrostatic generator was conducted by the chain through the suspended bar to the water in the glass held by assistant Andreas Cunaeus. A large charge accumulated in the water and an opposite charge in Cunaeus' hand on the glass. When he touched the wire dipping in the water, he received a powerful shock. The Ancient Greeks already knew that pieces of amber could attract lightweight particles after being rubbed. The amber becomes electrified by triboelectric effect,[a] mechanical separation of charge in a dielectric. The Greek word for amber is ἤλεκτρον ("ēlektron") and is the origin of the word "electricity". Around 1650, Otto von Guericke built a crude electrostatic generator: a sulphur ball that rotated on a shaft. When Guericke held his hand against the ball and turned the shaft quickly, a static electric charge built up. This experiment inspired the development of several forms of "friction machines", that greatly helped in the study of electricity. The Leyden jar was effectively discovered independently by two parties: German deacon Ewald Georg von Kleist, who made the first discovery, and Dutch scientists Pieter van Musschenbroek and Andreas Cunaeus, who figured out how it worked only when held in the hand. The Leyden jar was a high voltage device; it is estimated that at a maximum the early Leyden jars could be charged to 20,000 to 60,000 volts. The center rod electrode had a metal ball on the end to prevent leakage of the charge into the air by corona discharge. It was first used in electrostatics experiments, and later in high voltage equipment such as spark gap radio transmitters and electrotherapy machines. Ewald Georg von Kleist discovered the immense storage capability of the Leyden jar while working under a theory that saw electricity as a fluid, and hoped a glass jar filled with alcohol would "capture" this fluid. He was the deacon at the cathedral of Camin in Pomerania. In October 1745 von Kleist tried to accumulate electricity in a small medicine bottle filled with alcohol with a nail inserted in the cork. He was following up on an experiment developed by Georg Matthias Bose where electricity had been sent through water to set alcoholic spirits alight. He attempted to charge the bottle from a large prime conductor (invented by Bose) suspended above his friction machine. Kleist was convinced that a substantial electric charge could be collected and held within the glass which he knew would provide an obstacle to the escape of the 'fluid'. He received a significant shock from the device when he accidentally touched the nail through the cork while still cradling the bottle in his other hand. He communicated his results to at least five different electrical experimenters, in several letters from November 1745 to March 1746, but did not receive any confirmation that they had repeated his results, until April 1746. Daniel Gralath learned about Kleist's experiment from seeing the letter to Paul Swietlicki, written in November 1745. After Gralath's failed first attempt to reproduce the experiment in December 1745, he wrote to Kleist for more information (and was told that the experiment would work better if the tube half-filled with alcohol was used). 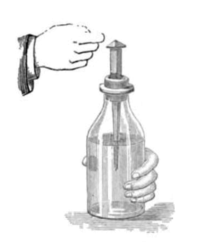 Gralath (in collaboration with Gottfried Reyger [de]) succeeded in getting the intended effect on 5 March 1746, holding a small glass medicine bottle with a nail inside in one hand, moving it close to an electrostatic generator, and then moving the other hand close to the nail. Kleist didn't understand the significance of his conducting hand holding the bottle—and both he and his correspondents were loath to hold the device when told that the shock could throw them across the room. It took some time before Kleist's student associates at Leyden worked out that the hand provided an essential element. The Leyden jar's invention was long credited to Pieter van Musschenbroek, the physics professor at University of Leiden, who also ran a family foundry which cast brass cannonettes, and a small business (De Oosterse Lamp – "The Eastern Lamp") which made scientific and medical instruments for the new university courses in physics and for scientific gentlemen keen to establish their own 'cabinets' of curiosities and instruments. Like Kleist, Musschenbroek was also interested in and attempting to repeat Bose's experiment. During this time, Andreas Cunaeus, a lawyer, came to learn about this experiment from visiting Musschenbroek's laboratory and Cunaeus attempted to duplicate the experiment at home with household items. Using a glass of beer, Cunaeus was unable to make it work. Cunaeus was the first to discover that the experimental setup could deliver a severe shock when he held his jar in his hand while charging it rather than placing it on an insulated stand, not realising that was the standard practice, thus making himself part of the circuit. He reported his procedure and experience to Allamand, Musschenbroek's colleague. Allamand and Musschenbroek also received severe shocks. Musschenbroek communicated the experiment in a letter from 20 January 1746 to René Antoine Ferchault de Réaumur, who was Musschenbroek's appointed correspondent at the Paris Academy. Abbé Nollet read this report, confirmed the experiment, and then read Musschenbroek's letter in a public meeting of the Paris Academy in April 1746 (translating from Latin to French). Musschenbroek's outlet in France for the sale of his company's 'cabinet' devices was the Abbé Nollet (who started building and selling duplicate instruments in 1735). Nollet then gave the electrical storage device the name "Leyden jar" and promoted it as a special type of flask to his market of wealthy men with scientific curiosity. The "Kleistian jar" was therefore promoted as the Leyden jar, and as having been discovered by Pieter van Musschenbroek and his acquaintance Andreas Cunaeus. Musschenbroek, however, never claimed that he had invented it,  and some think that Cunaeus was mentioned only to diminish credit to him. Within months after Musschenbroek's report about how to reliably create a Leyden jar, other electrical researchers were making and experimenting with their own Leyden jars. One interest was to see if the total possible charge could be increased. 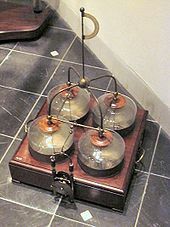 Johann Heinrich Winckler, whose first experience with a single Leyden jar was reported in a letter to the Royal Society on 29 May 1746, had connected three Leyden jars together in a kind of electrostatic battery on 28 July 1746. Daniel Gralath reported in 1747 that in 1746 he had conducted experiments with connecting two or three jars, probably in series. In 1748, Benjamin Franklin developed a system involving 11 panes of glass with thin lead plates glued on each side, and then connected together. He used the term "electrical battery" to describe his electrostatic battery in a 1749 letter about his electrical research in 1748, It is possible that Franklin's choice of the word battery was inspired by the humorous wordplay at the conclusion of his letter, where he wrote, among other things, about a salute to electrical researchers from a battery of guns. This is the first recorded use of the term electrical battery. The multiple and rapid developments for connecting Leyden jars during the period 1746–1748 resulted in a variety of divergent accounts in secondary literature about who made the first "battery" by connecting Leyden jars, whether they were in series or parallel, and who first used the term "battery". The term was later used for combinations of multiple electrochemical cells, the modern meaning of the term "battery". Starting in late 1756, Franz Aepinus, in a complicated interaction of cooperation and independent work with Johan Wilcke, developed an "air condenser", a variation on the Leyden jar, by using air rather than glass as the dielectric. This functioning apparatus, without glass, created a problem for Benjamin Franklin's explanation of the Leyden jar, which maintained that the charge was located in the glass. Beginning in the late 18th century it was used in the Victorian medical field of electrotherapy to treat a variety of diseases by electric shock. By the middle of the 19th century, the Leyden jar had become common enough for writers to assume their readers knew of and understood its basic operation. Around the turn of the century it began to be widely used in spark-gap transmitters and medical electrotherapy equipment. By the early 20th century, improved dielectrics and the need to reduce their size and undesired inductance and resistance for use in the new technology of radio caused the Leyden jar to evolve into the modern compact form of capacitor. A typical design consists of a glass jar with conducting tin foil coating the inner and outer surfaces. The foil coatings stop short of the mouth of the jar, to prevent the charge from arcing between the foils. A metal rod electrode projects through the stopper at the mouth of the jar, electrically connected by some means (usually a hanging chain) to the inner foil, to allow it to be charged. The jar is charged by an electrostatic generator, or other source of electric charge, connected to the inner electrode while the outer foil is grounded. The inner and outer surfaces of the jar store equal but opposite charges. The original form of the device was just a glass bottle partially filled with water, with a metal wire passing through a cork closing it. The role of the outer plate was provided by the hand of the experimenter. Soon John Bevis found (in 1747) that it was possible to coat the exterior of the jar with metal foil, and he also found that he could achieve the same effect by using a plate of glass with metal foil on both sides. These developments inspired William Watson in the same year to have a jar made with a metal foil lining both inside and outside, dropping the use of water. Early experimenters (such as Benjamin Wilson in 1746) reported that the thinner the dielectric and the greater the surface, the greater the charge that could be accumulated. Further developments in electrostatics revealed that the dielectric material was not essential, but increased the storage capability (capacitance) and prevented arcing between the plates. Two plates separated by a small distance also act as a capacitor, even in a vacuum. It was initially believed that the charge was stored in the water in early Leyden jars. In the 1700s American statesman and scientist Benjamin Franklin performed extensive investigations of both water-filled and foil Leyden jars, which led him to conclude that the charge was stored in the glass, not in the water. A popular experiment, due to Franklin, which seems to demonstrate this involves taking a jar apart after it has been charged and showing that little charge can be found on the metal plates, and therefore it must be in the dielectric. The first documented instance of this demonstration is in a 1749 letter by Franklin. Franklin designed a "dissectible" Leyden jar (right), which was widely used in demonstrations. The jar is constructed out of a glass cup nested between two fairly snugly fitting metal cups. When the jar is charged with a high voltage and carefully dismantled, it is discovered that all the parts may be freely handled without discharging the jar. If the pieces are re-assembled, a large spark may still be obtained from it. This demonstration appears to suggest that capacitors store their charge inside their dielectric. This theory was taught throughout the 1800s. However, this phenomenon is a special effect caused by the high voltage on the Leyden jar. In the dissectible Leyden jar, charge is transferred to the surface of the glass cup by corona discharge when the jar is disassembled; this is the source of the residual charge after the jar is reassembled. Handling the cup while disassembled does not provide enough contact to remove all the surface charge. Soda glass is hygroscopic and forms a partially conductive coating on its surface, which holds the charge. Addenbrooke (1922) found that in a dissectible jar made of paraffin wax, or glass baked to remove moisture, the charge remained on the metal plates. Zeleny (1944) confirmed these results and observed the corona charge transfer. Originally, the amount of capacitance was measured in number of 'jars' of a given size, or through the total coated area, assuming reasonably standard thickness and composition of the glass. A typical Leyden jar of one pint size has a capacitance of about 1 nF. If a charged Leyden jar is discharged by shorting the inner and outer coatings and left to sit for a few minutes, the jar will recover some of its previous charge, and a second spark can be obtained from it. Often this can be repeated, and a series of 4 or 5 sparks, decreasing in length, can be obtained at intervals. This effect is caused by dielectric absorption. In 1747–1748, Benjamin Franklin experimented with charging Leyden jars in series. ^ Dummer, G. W. A. (1997). Electronic Inventions and Discoveries, 4th Ed. Institute of Physics Publishing. p. 1. ISBN 978-0750303767. ^ Carman, A.P. (1916). "Electricity and magnetism". In Duff, A.W. A Text-Book of Physics (4th ed.). Philadelphia: Blakiston's Son. p. 361. ^ Heilbron, J.L. (1979). Electricity in the 17th and 18th Centuries: A Study of Early Modern Physics. University of California Press. p. 309. ISBN 978-0-520-03478-5. "Pieter (Petrus) van Musschenbroek". Compilation of biographies about Musschenbroek available from the Internet. 22 May 2004. ^ Baigrie, B. (2007). Electricity and Magnetism: A Historical Perspective. Greenwood Press. p. 29. ISBN 978-0-313-33358-3. ^ Anders, A. (2003). "Tracking down the origin of arc plasma science I. Early pulsed and oscillating discharges". IEEE Transactions on Plasma Science (Submitted manuscript). 31 (5): 1056. Bibcode:2003ITPS...31.1052A. doi:10.1109/tps.2003.815476. ^ Thomas S. Kuhn, The Structure of Scientific Revolutions (Chicago, Illinois: University of Chicago Press, 1996) page 17. ^ Heilbron, J.L. (1979). Electricity in the 17th and 18th Centuries: A Study of Early Modern Physics. University of California Press. p. 311. ISBN 978-0-520-03478-5. ^ Silva, C.S. ; Heering, P. (2018). "Re-examining the early history of the Leiden jar: Stabilization and variation in transforming a phenomenon into a fact". History of Science. 56 (3): 314–342. doi:10.1177/0073275318768418. PMID 29683000. ^ Heilbron, John L. (1966). "G. M. Bose: The prime mover in the invention of the Leyden jar?". Isis. 57 (2): 264–267. JSTOR 227966. ^ Heilbron, J.L. (1979). Electricity in the 17th and 18th centuries: a study of early Modern physics. University of California Press. p. 313. ISBN 978-0-520-03478-5. ^ Heilbron, J.L. (1979). Electricity in the 17th and 18th centuries: a study of early Modern physics. University of California Press. pp. 313–314. ISBN 978-0-520-03478-5. ^ Here is Nollet's own account of the event. Observations sur quelques nouveaux phénomènes d'Électricité" Mémoires de l' Académie Royale des Sciences De l'Année 1746, Paris, 1751, pp. 1-3. The account from the Academy of Sciences only refers to the "Leyden experiment" (l'expérience de Leyde): Sur l'Électricité" Histoire de l' Académie Royale des Sciences De l'Année 1746, Paris, 1751, pp. 1-17. ^ "Nollet, Jean-Antoine". Concise dictionary of scientific biography (2nd ed.). Charles Scribner's Sons. 2000. p. 652. ^ Heilbron, J.L. (1979). Electricity in the 17th and 18th centuries: a study of early Modern physics. University of California Press. p. 314, fn. 18. ISBN 978-0-520-03478-5. ^ Benjamin, P. (1898). A History of Electricity: the intellectual rise in electricity. Wiley. p. 521. and Abbé de Mangin (1752). Histoire générale et particuliere de l'électricité. Chez Rollin. p. 30. ^ Priestley, Joseph (1775). The History and Present State of Electricity, with original experiments (3rd ed.). London: London : Printed for C. Bathurst, and T. Lowndes ... J. Rivington, and J. Johnson ... S. Crowder, G. Robinson, and R. Baldwin ... T. Becket, and T. Cadell ... p. 108. Retrieved 25 April 2018. ^ Allerhand, A. (2018). "Who invented the earliest capacitor bank ("battery" of Leyden jars)? It's complicated". Proceedings of the IEEE. 106 (3): 498–500. doi:10.1109/JPROC.2018.2795846. Retrieved 28 April 2018. ^ Allerhand, A. (2018). "Who invented the earliest capacitor bank ("battery" of Leyden jars)? It's complicated". Proceedings of the IEEE. 106 (3): 500–501. doi:10.1109/JPROC.2018.2795846. Retrieved 28 April 2018. ^ Benjamin Franklin (1961). To Peter Collinson, April 29, 1749. In Leonard W. Labaree, ed., The Papers of Benjamin Franklin vol. 3: 1745–1750. New Haven: Yale University Press, p. 352: §18. For a discussion of the significance of this and other Franklin letters and how they express Franklin's explanation of "Muschenbroek’s wonderful bottle" see: Kuehn, K (2016). Müschenbroek's Wonderful Bottle. A student's guide through the great physics texts. Volume III. Electricity, magnetism and light. Undergraduate Lecture Notes in Physics. Springer. pp. 43–60. doi:10.1007/978-3-319-21816-8_4. ISBN 9783319218168. ^ Benjamin Franklin. "To Peter Collinson, April 29, 1749". "Chagrin’d a little that We have hitherto been able to discover Nothing in this Way of Use to Mankind, and the hot Weather coming on, when Electrical Experiments are not so agreable; ’tis proposed to put an End to them for this Season somewhat humorously in a Party of Pleasure on the Banks of SchuylKill, (where Spirits are at the same Time to be fired by a Spark sent from Side to Side thro’ the River). A Turky is to be killed for our Dinners by the Electrical Shock; and roasted by the electrical Jack, before a Fire kindled by the Electrified Bottle; when the Healths of all the Famous Electricians in England, France and Germany, are to be drank in Electrified Bumpers, under the Discharge of Guns from the Electrical Battery." §29. ^ Allerhand, A. (2018). "Who invented the earliest capacitor bank ("battery" of Leyden jars)? It's complicated". Proceedings of the IEEE. 106 (3): 501. doi:10.1109/JPROC.2018.2795846. Retrieved 28 April 2018. ^ Allerhand, A. (2018). "Who invented the earliest capacitor bank ("battery" of Leyden jars)? It's complicated". Proceedings of the IEEE. 106 (3): 496–503. doi:10.1109/JPROC.2018.2795846. Retrieved 28 April 2018. ^ Home, R.W. (2015) . "The Electrical Background". Aepinus's Essay on the Theory of Electricity and Magnetism. Princeton University Press. pp. 89–92. ISBN 978-1-4008-6952-7. ^ Heilbron, J.L. (1979). Electricity in the 17th and 18th Centuries: A Study of Early Modern Physics. University of California Press. p. 388. ISBN 978-0-520-03478-5. ^ "How Capacitors Work". 2007-09-17. ^ Wolf, A; McKie, D. (1962). A history of science, technology and philosophy in the 18th century (2nd ed.). London: George Allen & Unwin. p. 224. Watson, W. (1748). "III. A collection of the electrical experiments communicated to the Royal Society by Wm. Watson, F. R. S. read at several meetings between October 29.1747. and Jan. 21. following". Philosophical Transactions. 45: 92 ff. Retrieved 30 April 2018. ^ Anders, André (2008). "A Brief History of Cathodic Arc Coating". Cathodic Arcs: From Fractal Spots to Energetic Condensation. Springer Series on Atomic, Optical, and Plasma Physics. 50. New York: Springer. p. 9. doi:10.1007/978-0-387-79108-1_2. ISBN 978-0-387-79108-1. ^ a b Mills, Allan (December 2008). "Part 6: The Leyden jar and other capacitors" (PDF). Bulletin of the Scientific Instrument Society (99): 20–22. Archived from the original (PDF) on 2011-07-27. Retrieved 2010-06-13. ^ Addenbrooke, G. L. (March 1922). "A study of Franklin's Experiment on the Leyden jar with movable coatings". Philosophical Magazine. 6th Series. 43 (255): 489–493. doi:10.1080/14786442208633901. Retrieved 2010-06-22. ^ Zeleny, John (December 1944). "Observations and Experiments on Condensers with Removable Coats". Am. J. Phys. 12 (6): 329–339. Bibcode:1944AmJPh..12..329Z. doi:10.1119/1.1990632. ^ Fleming, John Ambrose (1911). "Electrostatics" . In Chisholm, Hugh. Encyclopædia Britannica. 9 (11th ed.). Cambridge University Press. p. 246. ^ Graf, Rudolf F. (1999). Modern dictionary of electronics, 7th Ed. Newnes. p. 192. ISBN 978-0-7506-9866-5. ^ Chisholm, Hugh, ed. (1911). "Leyden Jar" . Encyclopædia Britannica. 16 (11th ed.). Cambridge University Press. p. 528. Schechner, Sara J.“The Art of Making Leyden Jars and Batteries according to Benjamin Franklin.” eRittenhouse 26 (2015). Michelle Maranowski (19 February 2015). "Where There Is Charge, There Can Be Sparks!". Science Buddies. Science Buddies. Retrieved 8 September 2016. Science fair project idea.